Thin sheets of dough popular in Middle Eastern and Greek dishes, such as baklava or spanakopita. Wafer-thin sheets. Phyllo dough is quite delicate and are torn easily. Choosing: The best phylllo dough is fresh phyllo, but when buying packaged phyllo, choose one that is recently made. Buying: Commercially packaged phyllo dough are widely available in most supermarkets. Phyllo normally comes 25 or 50 sheets in a package, each sheet having been lightly sprinkled with corn flour to keep from sticking together. The most important aspect of working with phyllo is to keep the unused sheets covered with a towel or film to prevent drying. A typical method would be to remove one sheet, brush all over with melted butter or olive oil, then remove a second sheet, place on top and repeat. 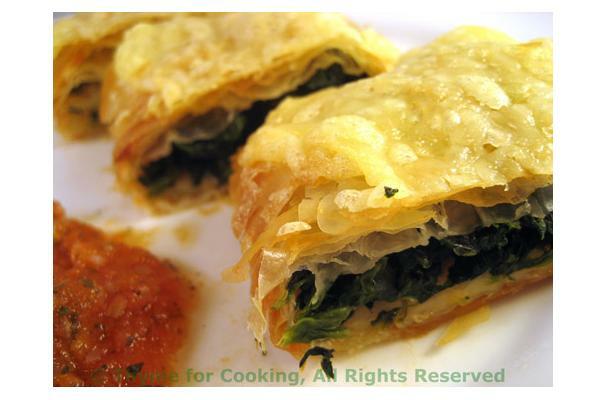 Phyllo can be used to make apple or spinach strudel, samosas, to wrap and bake salmon, as a base for tarts, etc. Phyllo dough can be stored for up to six weeks in the fridge and six months in the freezer. Packaged phyllo has a tendency to dry out easily. Opened phyllo packs should be kept covered with wax paper. The earliest form of phyllo dough had Turkish origins, even though the word "phyllo" is Greek. History: As early as the 11th century, the Diwan Lughat al-Turk, a dictionary of Turkic dialects by Mahmud Kashgari recorded pleated/folded bread as one meaning of the word yuvgha, which is related to the word yufka.The practice of stretching raw dough into paper-thin sheets is a later development, probably evolving in the kitchens of the Topkapı Palace.